From Home Data Entry, found at fromhomedataentry.com, is no exception to the never-ending fake data entry jobs websites that scammers use to rob you of your money. Besides hang a BBB ‘F’ rating From Home Data Entry charges you money to join, so paying your employer to be able to work should really be criminal. Should be, but since it’s not, this scam will be perpetrated until laws change. These guys are getting a little smarter now that many people are aware of this scam. 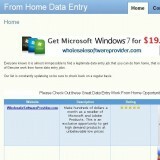 From Home Data Entry has a new twist that may make it appear as if it could be legitimate. Rather than hype you up with photos of mansions and yachts and the gazillions of dollars you will make in one minute without needing any skills, From Home Data Entry is offering a ‘free trial’ of seven data entry assignments to complete. Once you turn them in you’ll get a $10 credit to your account and $70 ‘deposited in your account. This is the bait. If you swallow the bait, you’ll most likely be excited to more work, right? Well, that’s where the switch comes in. They let you know that you cannot get the money for the work you just did unless you pay to sign up. Once you pay, they then let you know that you have to reach a minimum limit balance of $1000 before you can cash out! If you’re still not sure if that’s not enough to scare you away from From Home Data Entry then there is this little gem. Get over to the contact page before you sign up to see their wonderful greeting. Just to make sure you understand, you cannot communicate with these guys UNTIL you’ve given them your credit card information. Do department stores or burger joints utilize these tactics to bring in new employees? If you still feel like you can trust From Home Data Entry with your money and personal data, then I will say that there are so many complaints and bad reviews online, about From Home Data Entry that they would go broke trying to scrub their online image. Most deal with From Home Data Entry messaging users that the assignments submitted were incomplete and they don’t qualify to get paid, or users getting their accounts canceled for no reason before getting paid, etc. Truth is that all From Home Data Entry does is show you websites they are affiliates of in hopes of getting signups. Don’t count on them to pay you. Even though they require a $24.95 minimum from you to get paid for the work you did, these scammers will not pay you for it. Scared yet? If not then join From Home Data Entry at your own risk. It’s better if you don’t though.